We (I and my husband) visited Taman Bunga Nusantara (Nusantara Flower Park) Cipanas (West Java, Indonesia) last Saturday. The weather that day was changing all day. We reached the park at 07.30 am. It was a bright morning. But at 11.00 am until 1.00 pm, the rain was falling and the park was surrounded by the dark grey sky. Until we leaved the park at 2.30 pm, the sky was still not yet bright again, though the rain has stopped. 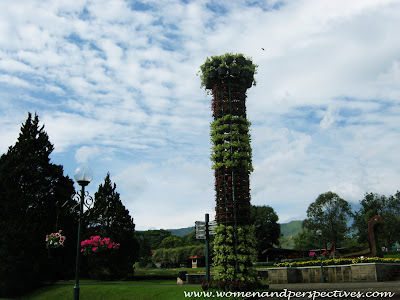 Inside Nusantara Flower Park, there are lots of beautiful things that you can see. 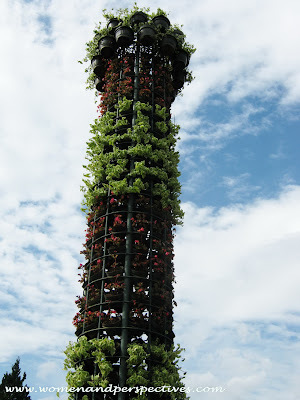 This plant tower is only one of them.